Linux history command is used to get previously used commands by the current user. Default size for the history command is 1000 which means that last 1000 command will be stored in the history. While listing history of bash line numbers are provided too. This is not expected in some situations. 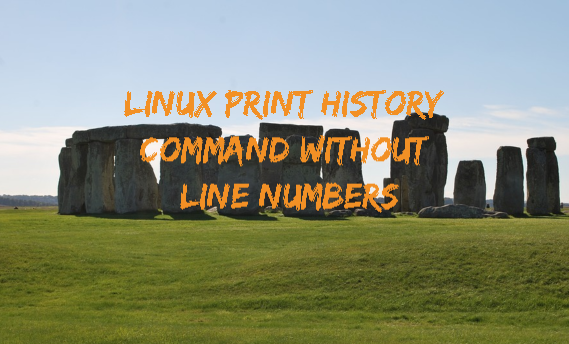 To get history without line numbers following commands can be used. Executed bash commands are stored in a file named .bash_history. This file is located every users home directory. For example for user ismail is will be located at /home/ismail/.bash_history. The simplest and easiest way is printing .bash_history file. History file stored commands in a plain format. awk is a very useful tool used to read strings and filter them according to given expression. With awk following command can be used to filter with substring. We will remove the command history line numbers with a expression which will get only commands from history command output. sed is alternative to the awk. We will use similar tactic where we will remove line numbers. We can use sed stream line editor to filter line numbers we will remove all numbers from start of the each line up to a space in this example. // is used to remove previously given regex which is numbers and spaces from start of the line. Cut is simplest example of the removing history line numbers. We will delimit output according to space and print columns start with 2 and others. -d is used to specify the delimiter which is space.